Seattle City Light is celebrating the installation of the largest solar array at any aquarium on the West Coast (Seattle Aquarium), as part of the utility's Community Solar and Green Up programs. The $330,000, 49.4 kW system covers a large portion of the south side of the Seattle Aquarium's roof with 247 solar panels. "This innovative project lets customers promote and benefit from solar even if they rent, have shady roofs or can't make the big investment of installing their own solar system," Sephir Hamilton, Chief of Staff for Seattle City Light, said. "When customers invest in solar, they also think harder about reducing their own electricity use in order to make the most of their solar production credits." A bill that would have made it easier for residents of high-rise apartment buildings and renters to switch to solar was killed in conference committee on Friday. Senate Bill 2934 was a priority piece of legislation for clean-energy advocates. The measure would have allowed residents without roof space or those living in areas where Hawaiian Electric Co.'s electric grid can't accommodate any more solar to still take advantage of solar energy. As solar spreads around the country, siting can become an issue. Sometimes that’s resolved by using already compromised land -- we’ve seen solar over parking lots or on landfills, even on some Superfund sites. Many large solar plants are built in desert areas in the Southwest, which have the advantages of ample space -- often not suitable for farming -- and plenty of sun. Those areas are not problem-free, though. 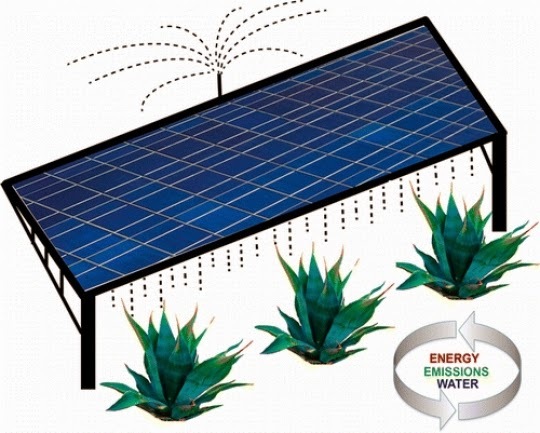 A lot of water is needed to clean solar panels in dusty, arid areas. Desert areas aren’t good for growing most crops. A lot of farmland is being used now to grow corn and other grains for ethanol, but grains aren’t the most efficient source for producing the fuel. ... And then Bernstein drops this bombshell: while solar has a fractional share of the market now, within one decade, solar PV (plus battery storage) may have such a share of the market that it becomes a trigger for energy price deflation, with huge consequences for the massive fossil fuel industry that relies on continued growth. “The behavior from here seems clear: the solar industry will expand. Retaliatory steps from distribution utilities will increase the market for cost-effective battery storage. This becomes -- initially -- a secondary market for battery technologies being developed for the auto sector. A failed battery technology in the auto sector (too hot, too heavy, too rigid a form factor) might well be perfect for the home energy storage market...with an addressable end market of 2 billion backyards. GRAND JUNCTION, Colo. - In just a few days, construction crews will break ground on a solar garden, unlike any other on the Western Slope. The project has been in the making for two years and partners are ready to see it finally get off the ground. Officials say it will be well worth the wait, will savings in the millions expected. What is now an empty lot, will soon bloom with energy. "A community solar garden is very new, new to Colorado and very new to the solar industry," said Eric Anderson, energy manager for School District 51. La Plata Electrical Association is getting into gardening – solar gardening. LPEA’s board of directors has approved a policy agreement with four community solar gardens that will allow its customers to purchase or invest in solar panels to offset their electrical costs. Policy 366, as LPEA is calling it, will set the stage for local, independent solar developers to construct community solar gardens, or CSGs, generating up to 2 megawatts of power in the LPEA service territory. You can get in on the ground floor of an investment that will rest on the roof of Icicle River Middle School in Leavenworth. Investors are being sought to help build a 14-kilowatt community solar installation on the middle school. A public meeting to explain the project will be held at 7 p.m. Thursday, April 17, at the Chelan County PUD office in Leavenworth, 222 Chumstick Highway. If successful, the project would be the first community solar farm in Chelan County to take advantage of the state’s Renewable Energy System Cost Recovery Program. TATHRA'S community solar farm has turned from imagination in to reality. At the official launch on Saturday morning, Matthew Nott from Clean Energy for Eternity and Bega Valley Shire Council general manager Leanne Barnes signed a memorandum of understanding, sealing the deal for a large solar array to be installed at the Tathra Treatment Plant. The solar panels will spell IMAGINE when seen from the air by passengers aboard flights into Merimbula. When complete, the solar farm will produce up to 50kW and account for 50 per cent of the power needs of the sewage treatment plant, which the council said costs around $50,000 a year to run. OREC is pleased offer a new series of Preference Shares, providing Ottawa residents an opportunity to invest in our community’s future while earning a good rate of financial return. A schedule of information sessions can be seen here. Hi. I was hoping you might support this project. I bought a solar light for this school in Tanzania. They installed it themselves. It allows the students to study at night. It allows the community to meet and work in the evening. For a very small donation you can help provide enough light for the whole school. Can you pass the word on this project? The pictures, video and story on the link above show you the panels, the lights, and the kids that will benefit from this project. We are more than half way there. I just need a few more donors to complete the project! Even if you can't support the project, please forward this to folks you think will be interested. New Hampshire, USA -- In yet one more example of the rising interest in how microgrids that incorporate renewable energy and energy storage will change the energy landscape, Missouri University of Science and Technology (MST) has created what it says is the first "Solar Village" in the U.S.